This is not a story about a poorly decorated home in need of a makeover and a splash of holiday cheer. 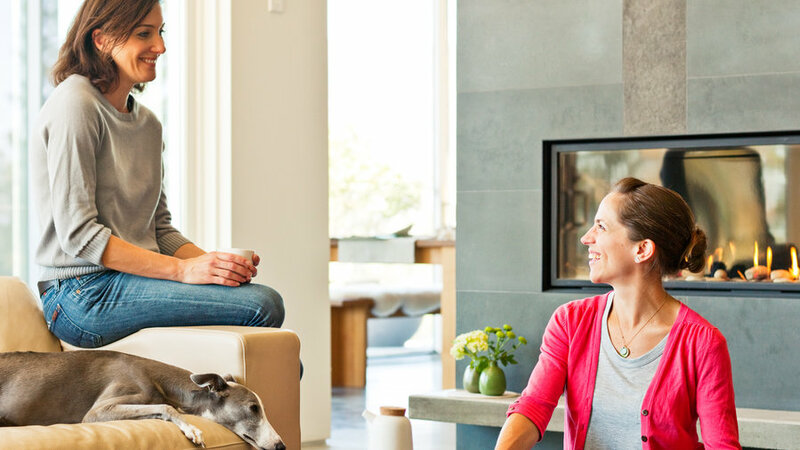 Owners Nadia Bizzotto and David Youngson are themselves in the design business (she founded the handbag company Two Loops; he’s a sales agent for the likes of Kikkerland), and their two-year-old house in British Columbia’s Okanagan Valley is cleanly modern—even their four whippets and two cats hew to the prevailing earth-tones palette. But when their friend Paige Russell, a ceramist, asked to help deck their place for the season, they were thrilled. “We love Paige’s homemade sensibility,” Nadia says. “She shows us how warmth can still be modern,” adds David. Just call Paige their holiday fairy. How to: With a 1/16-inch hole punch, notch the top center of the front of a blank folded card, then make seven notches along the bottom. Behind the top notch, attach the start of some embroidery floss to the card with a small piece of double-sided tape. Wrap the floss around the front of the card seven times, so that it lies in a different bottom notch with each loop. Cut the floss and attach the end to the piece of double-sided tape. 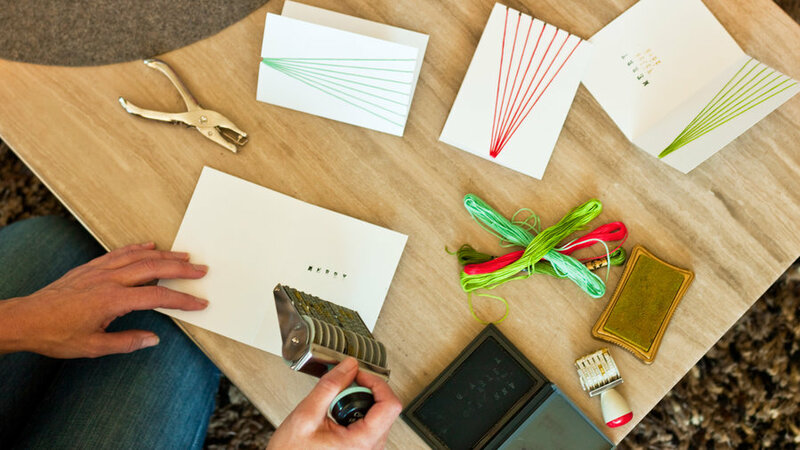 Print a holiday greeting using a date/number stamp and ink pad. Get it: Large teapot ($145) and cup ($20) from the Spout collection by Paige Russell. Create a merry scene along your winter dinner table runner. How to: Punch stars out of card stock using a star craft punch. Sprinkle them along the runner, and intersperse miniature trees among candles. Porcelain and wood beasts, inspired by Old World ceramic collectibles, double as placecards—Paige writes the names on them with a colored pencil. A small bowl of nuts sits forkside at each place setting, accompanied by a nutcracker (and a metal jack, just for kicks). Get it: Coupe plates ($32 each) and bowls ($27 each) by Heath Ceramics. 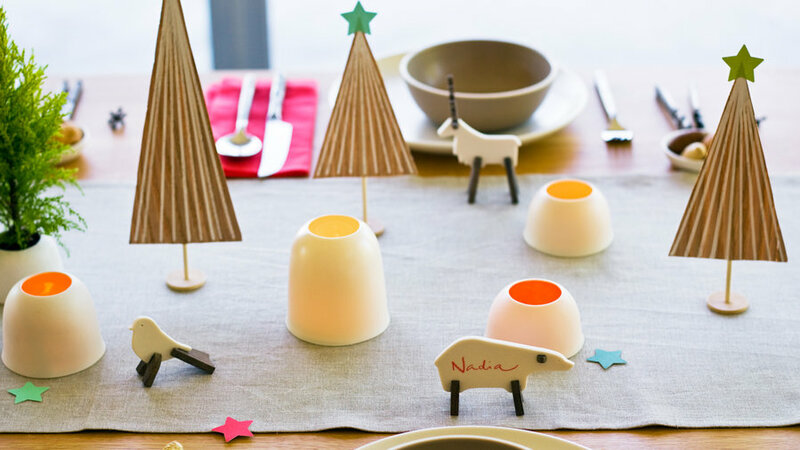 Spout dishes ($48/set of 4), Müzo Collectibles animals ($24 each), and the Woods trees ($15 each) by Paige Russell. 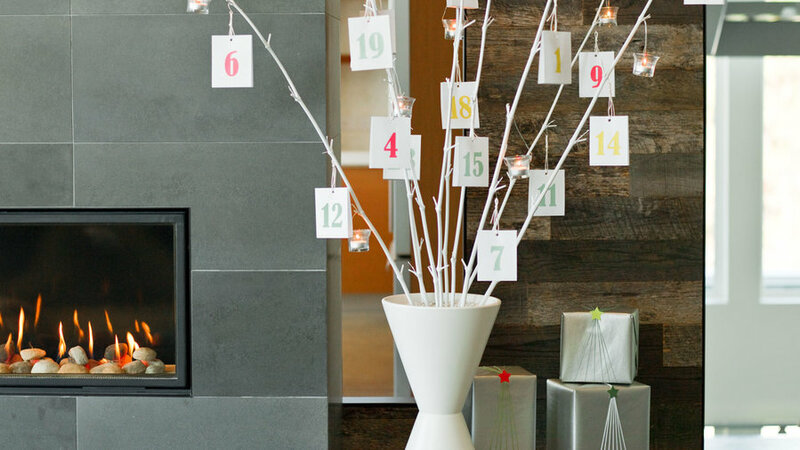 The calendar meets the holiday tree—and it’s not just for kids. Get full instructions and templates for making your own–including tutorial videos from Paige–here. Try a newfangled take on the traditional grade-school project. How to: Plan your design on paper (figuring out how many snowflakes you want, and where), then mark it on a wall. Punch circles out of card stock with a circle craft punch. 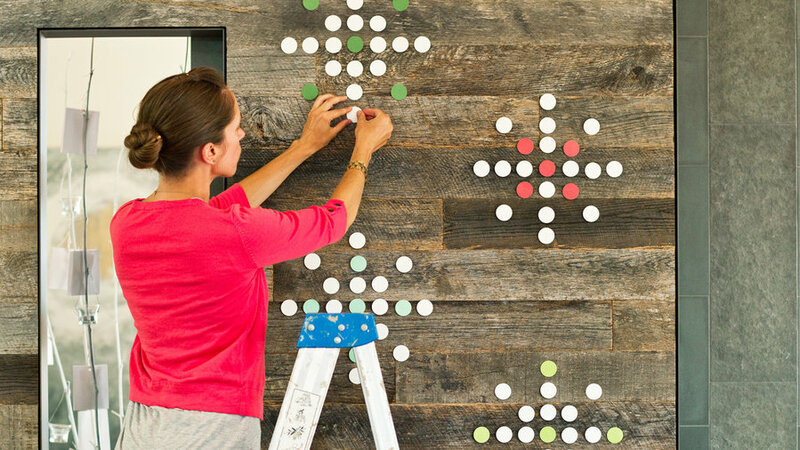 For a wooden or textured wall, place thumbtacks where you want the dots to be, put a piece of removable double-sided tape on each tack, and place your dots. For smooth surfaces, put a piece of tape on the back of each dot, and place. Get it: Supplies for all these projects (craft punches, card stock, tape) from craft stores like Michaels. 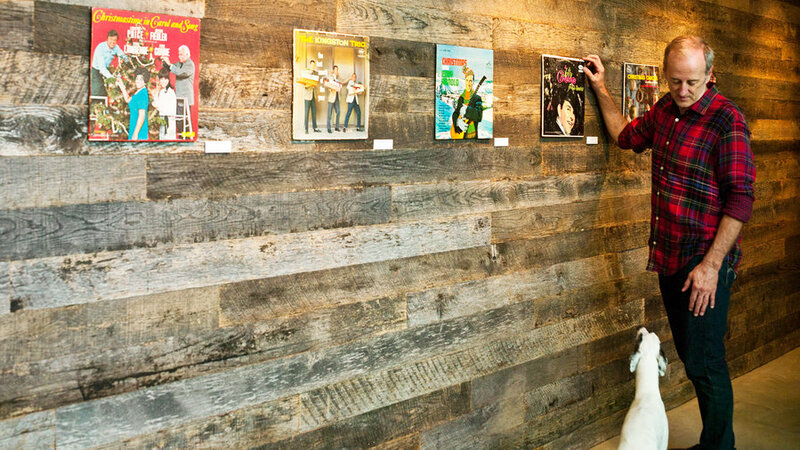 Album covers and song lyrics— a tribute to the couple’s love of music—adorn the entry wall. How to: Print a lyric from each album on white paper, then mount it on foam board with double-sided tape. Trim sides. Attach a strip of foam board high on the back of each album cover with double-sided tape. Hang each on a wall with a single small nail (under the center of foam strip). Place lyric cards next to the albums with double-sided tape. Get it: Find old albums at flea markets, antiques stores, or on eBay.